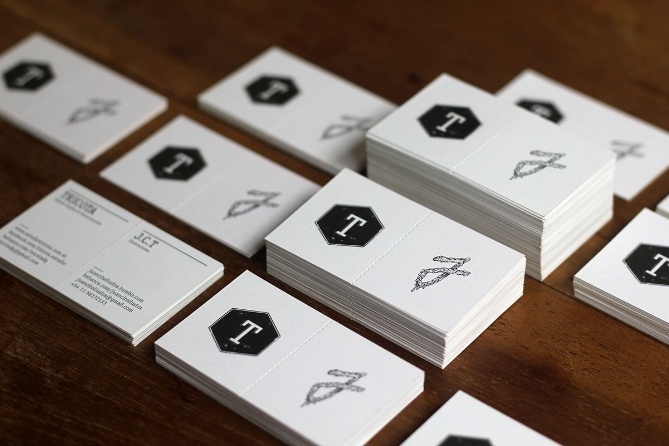 The business card isn't dead yet. As long as there are parties, industry events, and networking opportunities, there will be business cards. And it's important that yours isn't thrown to the bottom of the pile because of a lackluster design. 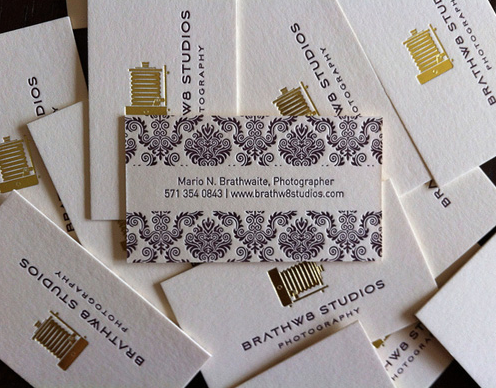 Whether you work at a bigwig agency or as a freelancer, your business card should make a memorable first impression. 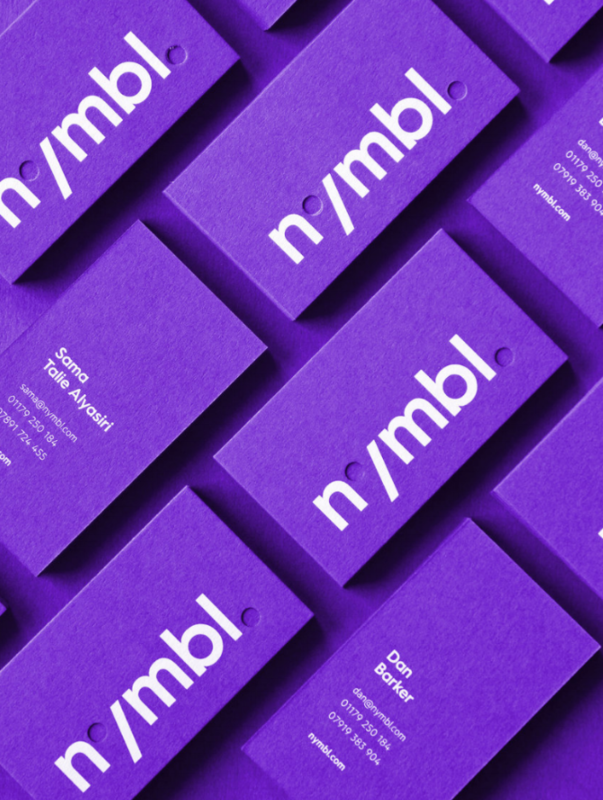 To help you out on the inspiration front, we've compiled a list of 19 of the best business card designs from agencies, designers, and businesses around the world. 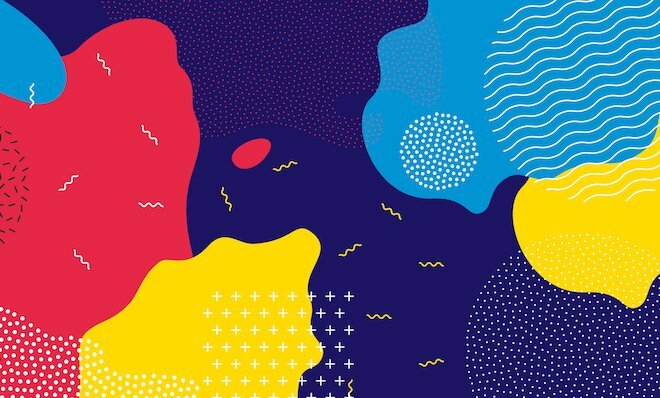 Ranging from artistically elaborate to decidedly simple, these examples are certain to inspire your next business card redesign. 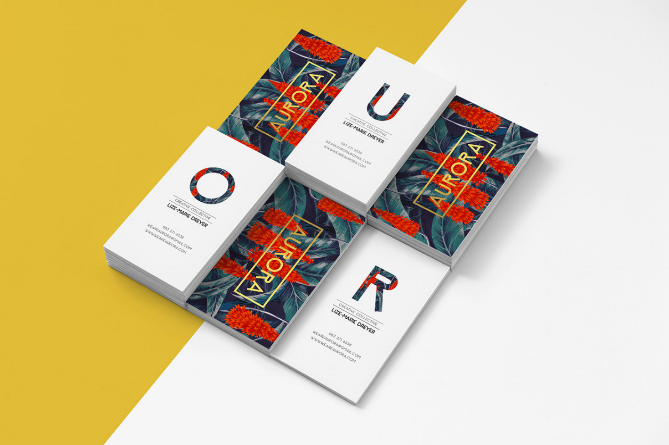 Featuring a botanical illustration of tropical blooms and a clean sans-serif font, these business cards from Aurora certainly make a stylish first impression. 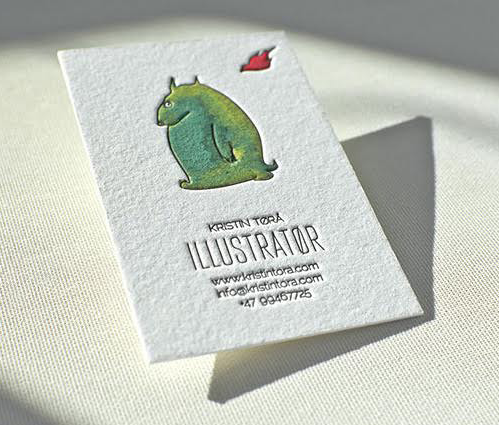 The South African studio specializes in whimsical artwork and design, so it's fitting that their business cards reflect their unique skill set. The cards were designed in-house and include gold embossed details. 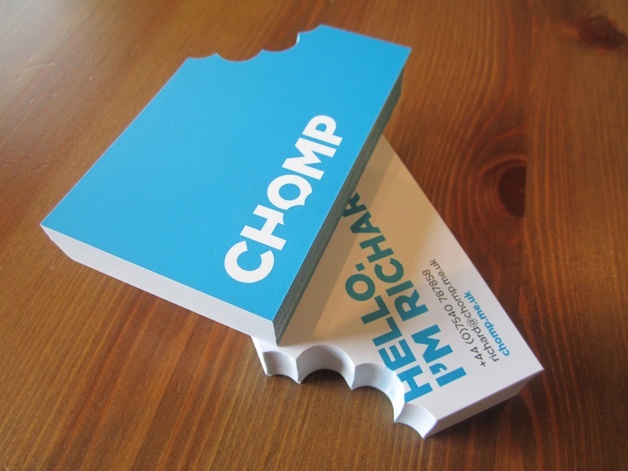 In a literal interpretation of the company's name, London-based agency Chomp designed business cards with a bite-size chunk missing from one corner. 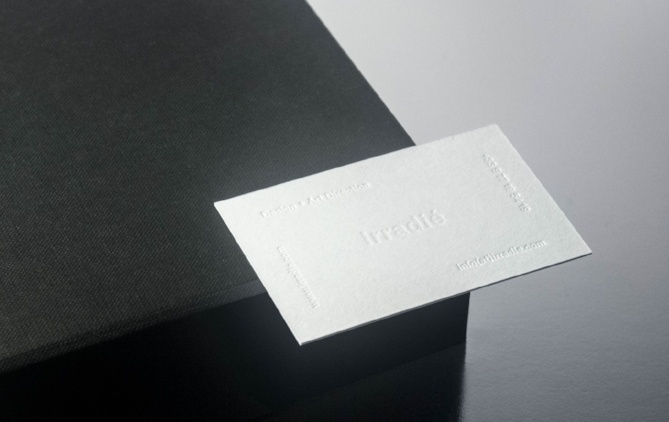 The shape of the card stock mimics the detail of their logo -- which also bears teeth marks. 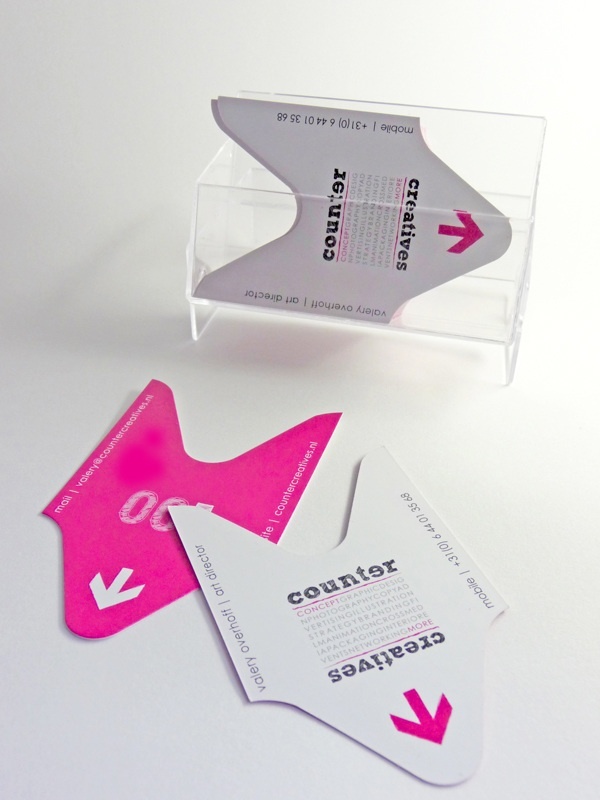 If you want your business card to stand out, non-traditional materials will help you do just that. 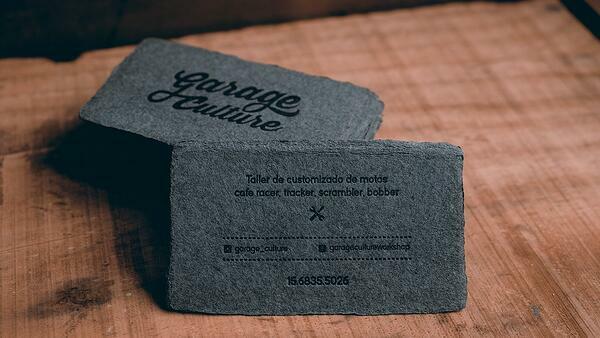 Designed by Rodrigo Cuberas, this bike garage business card uses cotton paper stock as the base for its stunning, simplistic design. 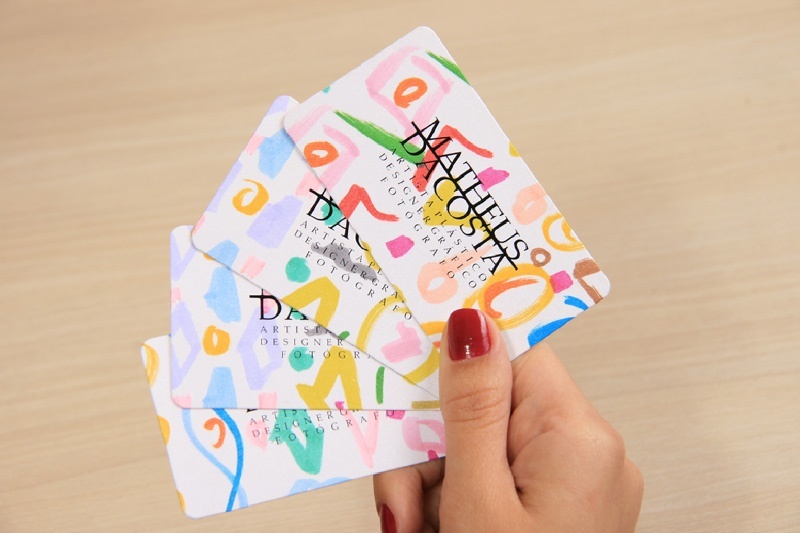 Brazilian designer Matheus Dacosta puts an artistic spin on traditional business cards, adding kaleidoscopic, hand-painted designs to every individual card. Each miniature work of art is sure to make a memorable impact -- or at the very least, make the recipient reluctant to simply toss it. 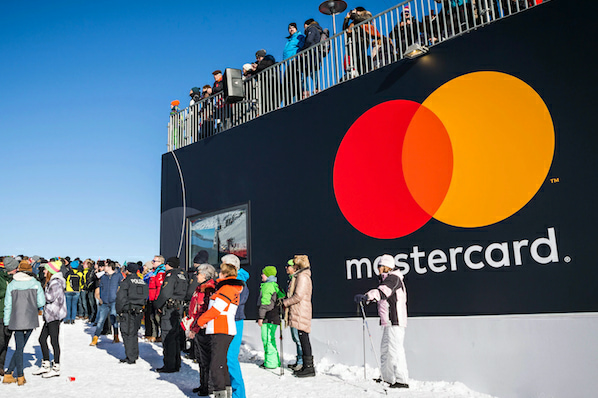 Here's a great example of a business that played to its strengths. Trick & Treat-- and branded entertainment company -- offers one of the most creative business cards we've ever seen. The design transforms into a tabletop game, which aligns perfectly with Trick & Treat's playful brand. 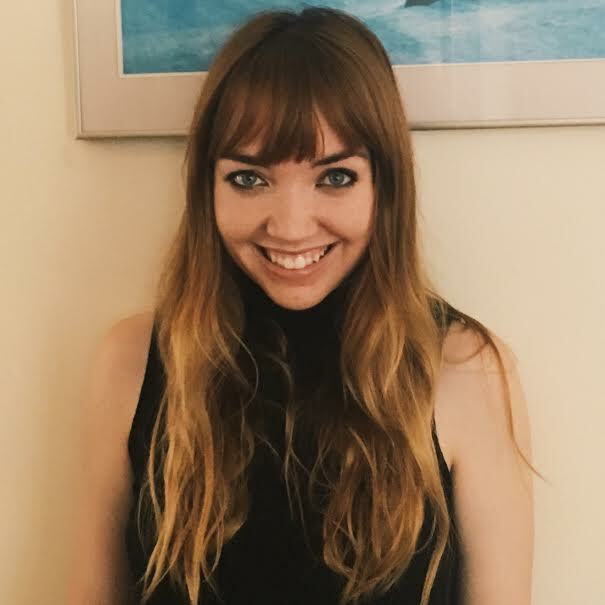 This video production agency may get its name from a spooky folk creature, but the quality of their business card design is far from terrifying. Designed by the talented folks at The Distillery, these unusual cards put the focus on meticulously detailed, embossed illustration: a feather, a piece of wood, and a beastly skull can be seen behind the contact information. 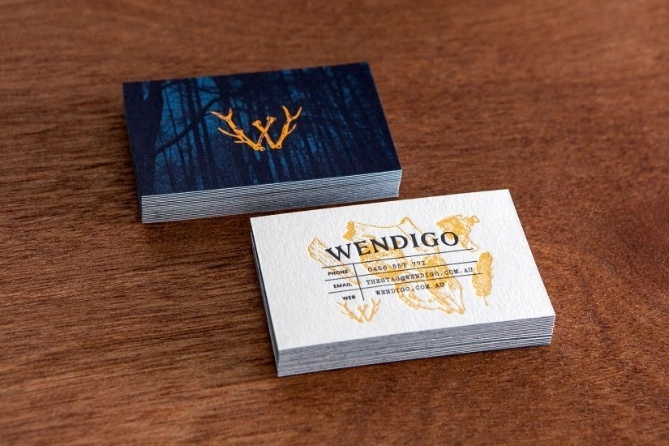 A pair of interlocking antlers -- presumably from the feared Wendigo itself -- form the "W" in the agency's name. These gold-foiled business cards designed for a professional photographer serve as a great example of how to effectively marry pattern, texture, and simplicity. We especially love how they cut the pattern in the middle to create a clean canvas for the contact information. Tastefully done. 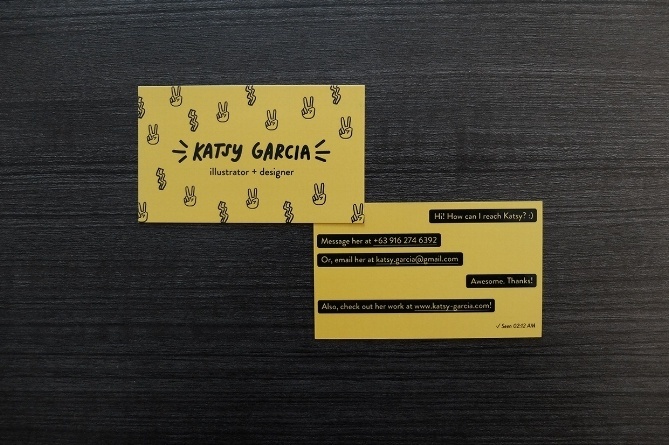 Illustrator and graphic designer Katsy Garcia whipped up this simple but effective business card concept for her own personal branding. Instead of displaying her contact information in the usual straightforward format, Garcia serves up a fresh twist, displaying hers in an instantly recognizable text message composition. The resulting effect is equal parts charming and sharply clever. 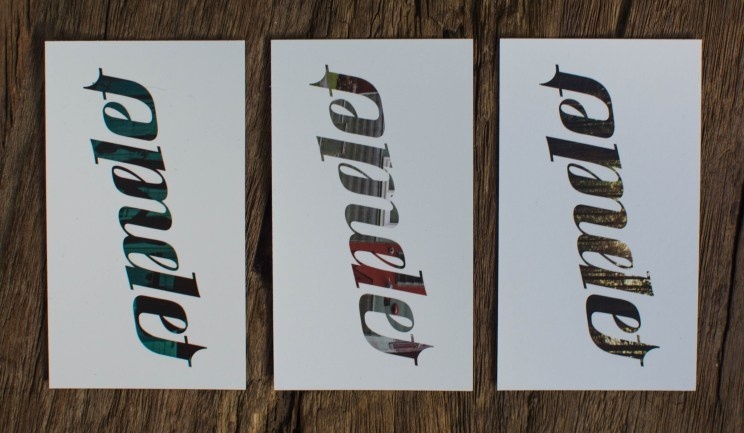 In a nod to their native L.A., Omelet created business cards centered around sleek city imagery. The photographs are artfully silhouetted by their company logo -- which if you look closely, is actually an ambigram. Designed to resemble a classic take-a-number ticket, this inventive business card was devised for Dutch agency Counter Creatives by designer and art director Valery Overhoff. The compact format and unconventional shape called for a creative use of space, and Overhoff manages to feature multiple typefaces and both vertical and horizontal text. 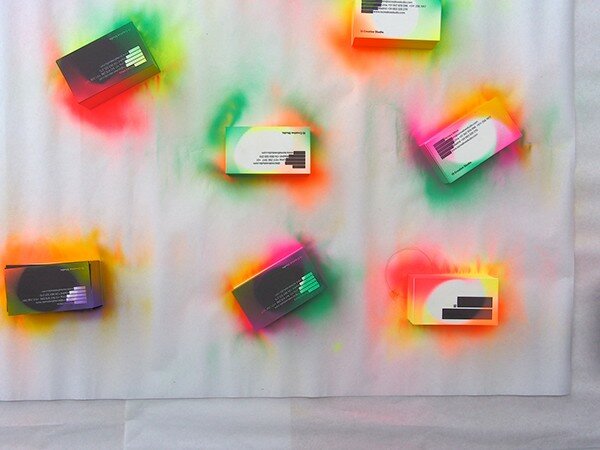 Thanks to airy swipes of neon spray paint, these otherwise minimal business cards from IS Creative Studio make a big impact. 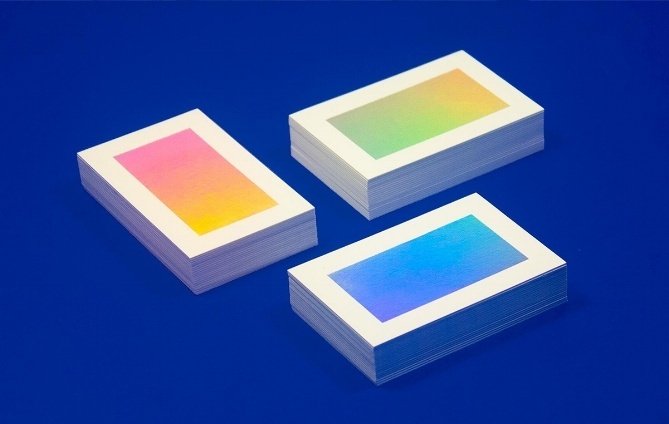 The Peru-based agency has developed three iterations of these award-winning cards, increasing the breadth and intensity of the color pallette each time. This most recent version highlights everything from electric pinks to vibrant greens. 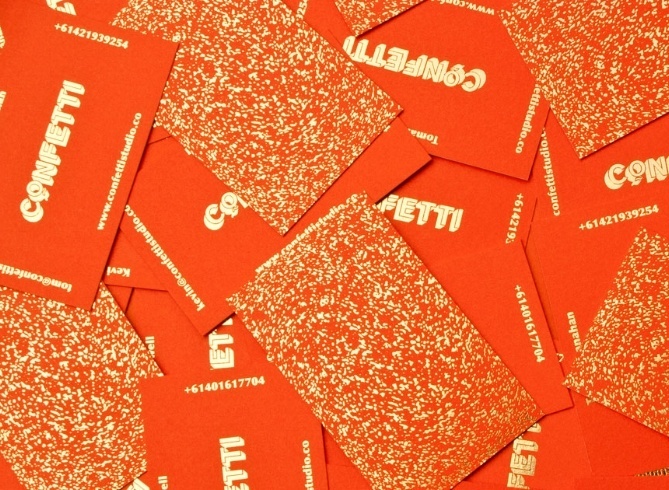 These business cards from Confetti Studio combine two powerful elements -- punchy orange card stock and gold embossed metallics -- to a create a mesmerizing and modern effect. One side of the card is completely covered in gilded speckles, while the other side displays the agency's logo and contact information -- also gilded. They fittingly call the end result "cardfetti." 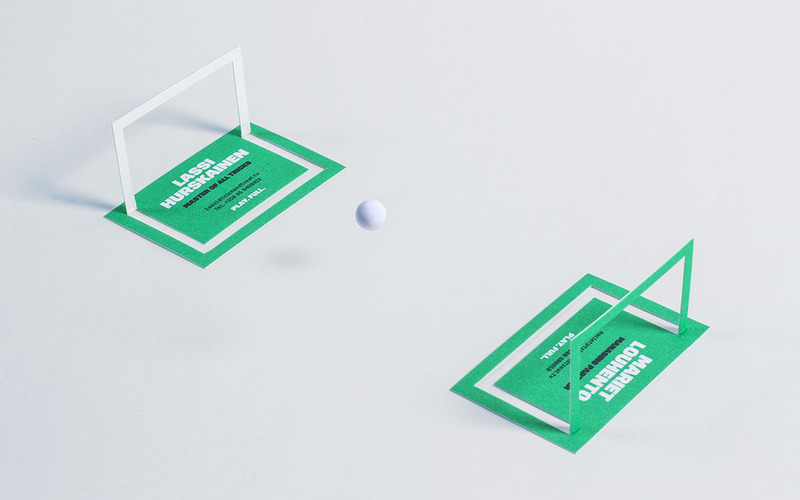 Buenos Aires-based agency Tricota found an interesting way to highlight the two sides of their business: perforated cards that split in half. 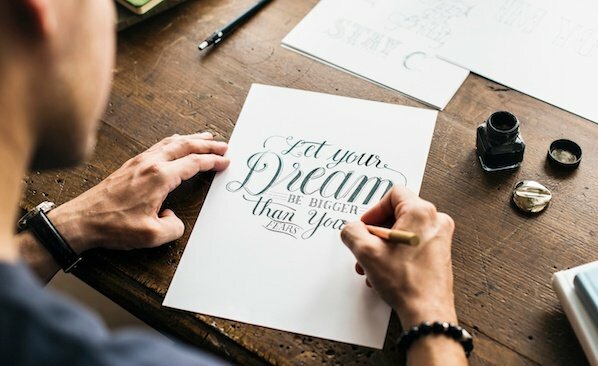 Once side features information for their communications and graphic design services, while info for their illustration services appear on the other side. Each half includes a variation of their "T" logo: a typeface "T" for their communications side and and an hand-drawn "T" for their illustration side. 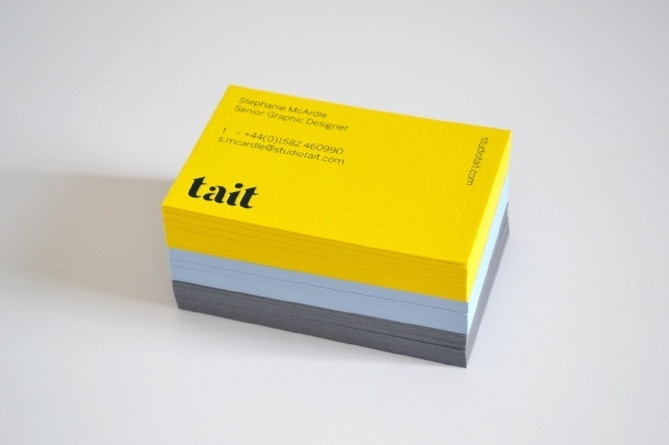 When this design studio wanted to give their corporate identity a facelift, they turned to fresh card stock in yellow, smokey blue, and azure. Using minimal text against a sophisticated color palette yields sleek results. 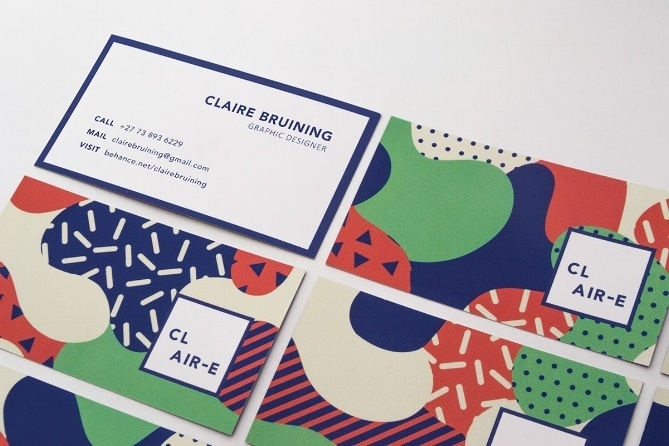 Graphic designer Claire Bruining developed these playful business cards for her own personal branding. Splashes of overlapping patterns and colors appear on one side, and Bruining's contact information appears on the reverse in a clean sans serif font. The dark blue text and border adds an unexpected pop to the basic layout. 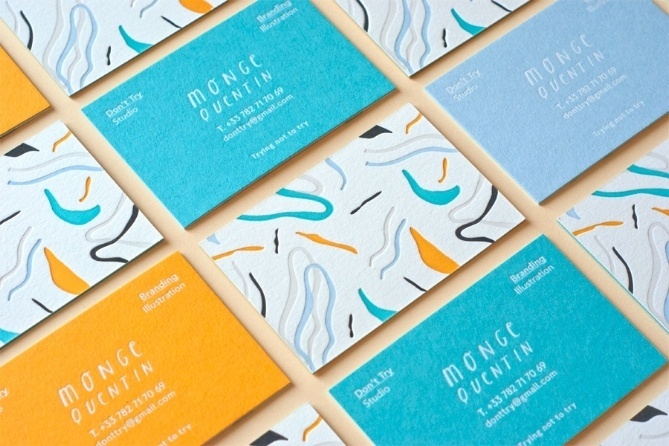 Monge Quentin, the Parisian illustrator behind Don't Try Studio, created these lively and colorful business cards to promote his design work. 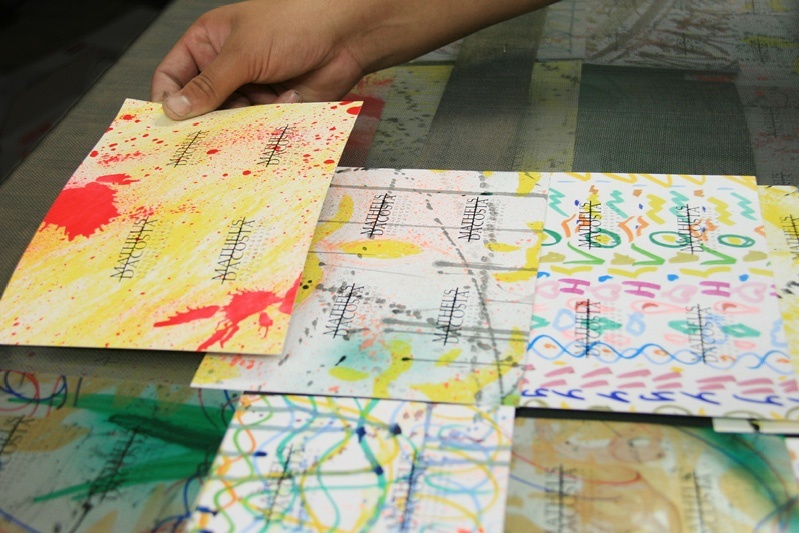 Thanks to an embossing technique, the face of the cards are embellished with confetti-like brush strokes and shapes in a muted orange and blue color scheme. His name appears in a handwritten print. 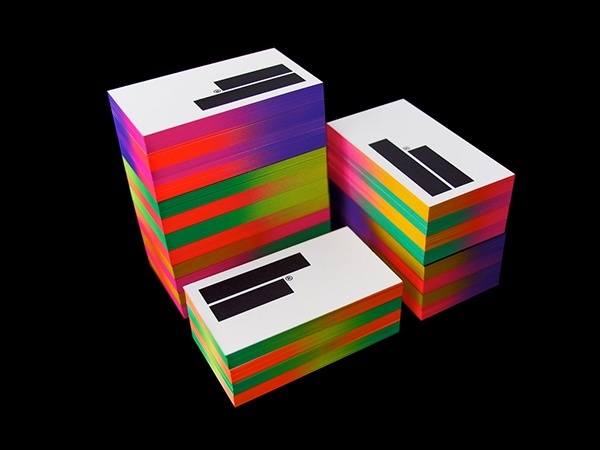 The logo on these business cards for digital production studio Bespoke is so large, it actually wraps around from the front of the card to the back. 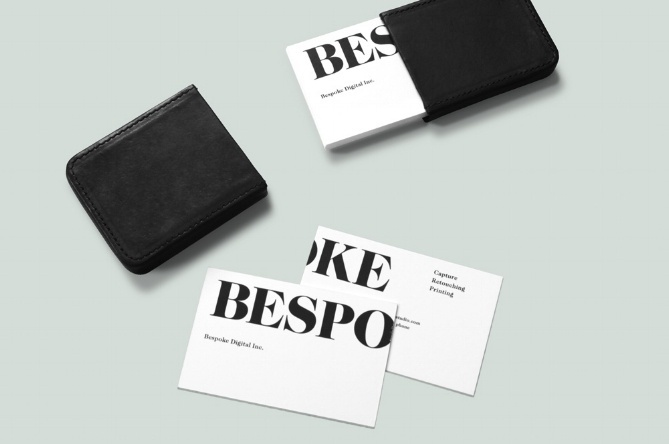 A fellow New York agency -- Studio Newwork -- designed these cards to be both minimal and unexpected. At first glance, the face of these Atelier Irradié business cards look like otherworldly color swatches. In stark contrast to the metallic, jewel-toned gradient on the front, the back of these cards don't even use ink -- just simple, imprinted text displaying their contact information.